Estates - Antiques - Collectibles - Furniture - Household Items - Jewelry - Coins - Stamps - electronics - rugs, pottery, military, Cars - Trucks - RV's - Motorcycles - Campers - Boats - Farm Machinery & Equipment - you name it we probably will sell it or buy it! LOOKING TO HAVE AN ESTATE SALE HOWEVER DONT WANT THE HASSLE OR HEADACHE?? CALL US! WE TAKE EVERYTHING TO AUCTION INSTEAD OF DEALING WITH THE NONSENSE OF HAVING THE HEADACHE AND WE SELL AT AUCTION AND SEND YOU A CHECK! EASY AS THAT!!!!! At COUNTRY PICKINS, Inc. we take care to provide our customers high quality services personalized for their unique auction needs. We do it all, buy, sell, consignment, you name it! Our staff members are professional, courteous and efficient. 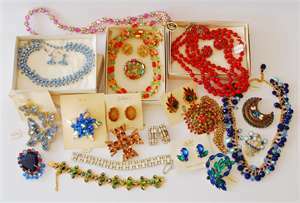 TONS OF JEWELRY AT EVERY AUCTION!